Last night I dreamed I was taking my eight-year-old daughter to perform in a half-term dance show. Along the way, I became increasingly weighed down with an unlikely assortment of baggage. These ladies showed me some items to be put on stalls there, including knitted children’s garments. (Fellow villagers need not panic: this is definitely NOT part of the plan in real life!) They gave me some knitting wool and patterns to take away. (Note to self: once awake, I must finish those bootees for Laura’s dance teacher’s baby, due very soon.) We talked about catering plans, tasted a few dishes, and I came away with some soup in a plastic carrier bag. A leaking bag of soup is not an easy thing to carry when you already have under one arm two large rag dolls and a giant Gruffalo toy. Product placement in dreams? How does that happen? 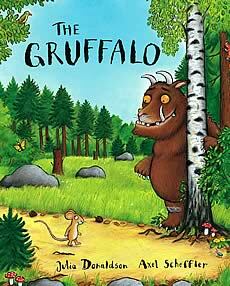 I realised later that the Gruffalo must represent my part-time job at the children’s charity Readathon. As I tried various doors and stairways to escape, I bumped into my friend Louise and her husband in fancy dress. Louise is fundraising for the Emmaus homeless charity by spending a night in the village bus shelter. It was at the back of my mind that I haven’t sponsored her yet. The soup was continuing to drip but the hotelier blocked my exit, hoping I’d buy a drink at the bar. To my credit, I didn’t – I was determined to get out of this muddle without resort to stimulants. Finally, somehow, I made it back to the dance hall, just in time to watch my daughter’s show. There was applause as I gathered up my bags to take them home. What would Freud make of it all? My conclusion on waking? Well, perhaps it should have been to take note that I’m making more commitments than I can cope with and to reduce my responsibilities. But my overriding emotion was anxiety that I couldn’t remember which dance my daughter had done. Oh – and a firm resolve to give up alcohol. I’m blaming my restless night on the Valentine’s Day champagne! Intriguing, enjoyable and a release from everyday work for a while. As for Freud 1856-1939, I am sure that he would have had some thoughts about your unconscious mind. He proposed dreams as representing fulfilled wishes of the dreamer. How did the dancing go? In the dream that is. Never be hesitant about dreams Debbie. Freud may have had his own and published thoughts. However the ability to dream was given to us by God. What we dream though is totally dependant on who we are in our heart. That could be thought provoking, so just to clarify a little. What we do ie: watch, say, act, do, all represent the make up of our heart. I don’t know you personally Debbie, but from what I read you come across as a very caring mother and in your general presentation of you’re being, which is in the public eye. I would therefore suggest that most of if not all your dreams are of a warm and caring nature. Anything of a different kind would be due to a difficulty of some kind in your life. Therefore I would add that you have got a good heart. Thank you for your thoughtfulness and insight. Dreams are indeed precious and I think sometimes, just to mix my metaphors, they can be a real wake-up call too! But our lives would be poorer if we didn’t have the ability to dream.